Inspired by the best-selling Brush 02, this brush’s tapered tip makes highlighting and bronzing with creams, liquids, and powders easier than ever before. The silky-soft, undyed bristles flex with facial curves for a smooth, streak-free application, whether you're sculpting your cheeks or applying setting powder to bake under-eye concealer. Brush 10 is also available with The Face Set. Use the tip to apply bronzer and blush along the cheeks and temples for precise, natural-looking color payoff. With light pressure, the bristles spread out to blend products to an airbrushed, poreless finish. We recommend washing your brush occasionally with warm water and a gentle soap or brush cleanser, such as Clean Apothecary Brush Shampoo. Dry your brush with a Brush Guard to maintain the shape of the bristles. Let me start by saying that I absolutely LOVE Beautylish!! Their shipping and customer service is superb! Now let's talk about the brush.... Pros: Great price point , super soft, durable (has not shed) Cons: Size (let me explain) Although it says on the description it is a cheek brush, it is not suitable for that area. It is great however for highlight (on top of the cheeks). The size is rather small and very tapered. If you dip this brush in blush, you will end up with excess blush on a small area of your cheek. I bought it to be used for blush, but use it for highlight instead. 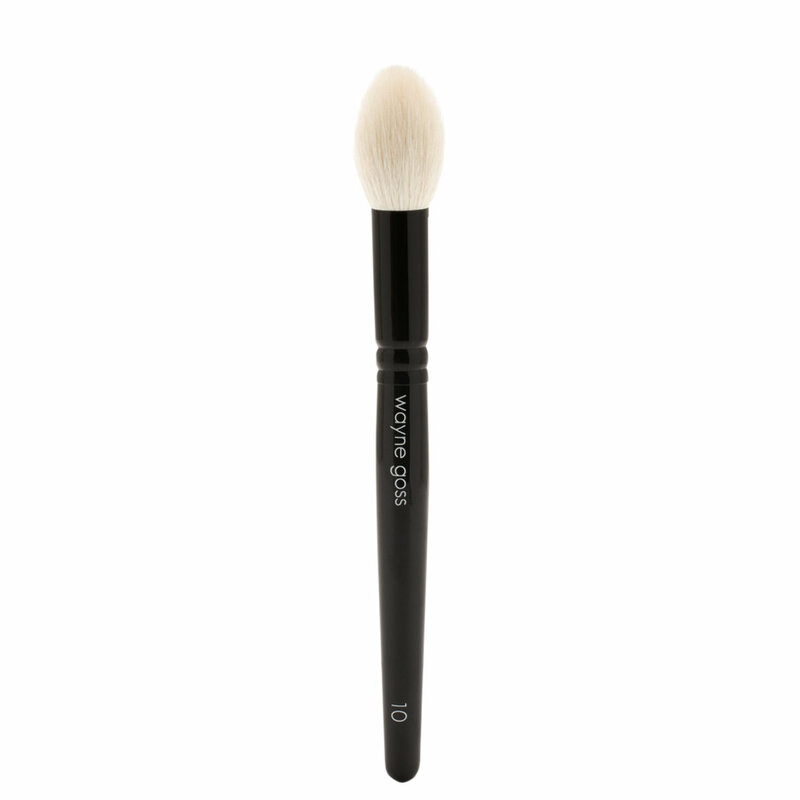 This is a denser sister of the Wayne Goss 02 Brush. Though equally soft the 10 Brush is less airy and has more buffing power and is going to pick up more product than a squirrel hair brush. I bought mine specifically to buff in highlighter. It hugs the cheekbones perfectly! Love this new Wayne Gosh brush. Picks up the perfect amount of pigment and glides on beautifully. Have used it for powder contour, blush and highlight. Very pleased and can't wait to buy more from his new line! I have a hand full of his first collection and adore then! Super soft and works for contour and blush. This has the same shape as Brush 02, but slightly denser, equally soft. 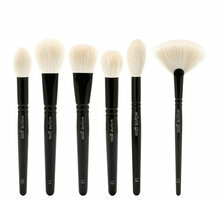 I'm in love with Wayne Goss brushes and have been buying them in batches over and over again. I have sensitive skin that turns red and irritated if I over-buff a product over my face. But I never get that problem with these brushes because they are so soft. I can’t knock the brush itself, because overall it is amazing. Well made, nice weight, extremely soft. I would just say the description of the brush is off and should probably be rewritten. I agree with other users - this brush is not suitable for blush or bronzer because it’s too small and dense. However, I haven’t yet tried it with cream products and it may work okay with them. That being said, this is the BEST highlight brush I have ever used. It’s so soft and smooth, so it diffuses highlight perfectly and it’s just the right size for the high points of the face. All in all, it’s a Wayne Goss brush - it’s amazing. This brush feels like a bunny. It applies blush, highlight, under eye powder really soft and pretty Love Love Love Wayne Goss brushes. And Beautylish has the best customer service and the package is beautiful! This is a perfect sculpting brush. It fits perfect in the hollows of the cheeks and around the perimeters of the face. It’s a little small for blush for my shaped face. It also is great for highlighting. It’s super soft and blends powder into the skin like butter. It’s a beautiful brush. SO SOFT and PERFECT for CONTOUR and BLUSH!! 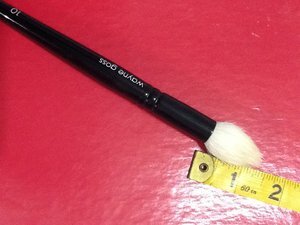 This brush is almost the exact shape and size as BRUSH #02 which I also love. This brush can apply liquid, cream and powder contour which I am so happy about. The size allows me to put contour products perfectly. It is also super easy to clean. liquid and cream products don't get absorbed by the hairs at all!!! I have decided to let go of my other contour brushes and stick to this one. I might just purchase another one soon!! The bristles are the softest I’ve ever used. It applies powder evenly and does not disturb my foundation underneath.